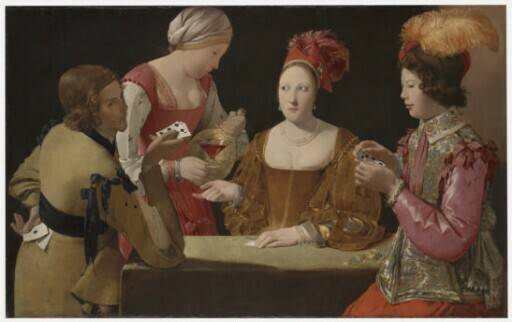 One of the greatest masterpieces of seventeenth-century French art, Georges de La Tour’s Cheat with the Ace of Clubs takes as its subject the danger of indulgence in wine, women, and gambling. While the theme harks back to Caravaggio’s influential Cardsharps, also in the Kimbell, the roots of this engaging morality play can be traced to earlier representations of the biblical subject of the prodigal son. La Tour’s dazzling colors and elaborate costumes create a brilliant tableau. His characters enact a psychological drama that unfolds through the cues of their sidelong gazes and the measured gestures that signal their next moves. The cheat tips his cards toward the viewer, who thereby becomes complicit in the scheme, knowing that in the next moment, the conniving trio of cheat, maidservant, and courtesan (identified by her low-cut bodice) will prevail. Another autograph version of this subject, Cheat with the Ace of Diamonds (Musée du Louvre, Paris), displays abundant variations in details of color, clothing, and accessories. For most of his life, La Tour remained in his native duchy of Lorraine, remote from Paris. Although he created some of the most visually compelling images of his age, soon after his death he fell into obscurity. It was only in the early twentieth century that his oeuvre began to be rediscovered.